Würth Elektronik and Infineon Technologies AG are jointly offering a complete and ready-to-use 200W wireless power system. With this kit engineers can discover the advantages of this technology for themselves and easily integrate it into product designs. Applications are expected to include: Drones, robotic lawn mowers and power tools; Industry 4.0 and IoT; Industrial applications; Devices in a medical environment; and Devices with a large number of mating cycles to avoid connector damage. This development kit is based on a full-bridge resonance converter. This circuit is not self-oscillating; the switching frequency is determined by the oscillator and is tuned to the resonant frequency of the series resonant circuit. The circuit diagram (below) can be divided into the following sections: Oscillator with fixed duty cycle (50%) and full-bridge MOSFET driver; Full bridge of 4 switching elements (MOSFETs); Series resonant circuit consisting of resonance capacitor and WPT transmitter coil; Series resonant circuit consisting of resonance capacitor and WPT receiver coil; and Rectifier (bridge rectifier or synchronous rectifier). The flow of current in the resonance circuit is sinusoidal and a phase shift between the voltage signals and the current signal occurs. This phase shift occurs because the switching frequency of the full bridge is above the resonant frequency of the series resonant circuit. The operating point is located in the inductive range of the series resonant circuit; the current will follow the voltage. With the ever-increasing spread of wireless power transfer in consumer electronics, e.g. in smartphones and charging stations, manufacturers of industrial and medical technology are focusing more and more on this technology and its benefits. This technology offers interesting approaches, especially for industries and areas where harsh working conditions are common, such as construction machinery, explosive atmospheres (ATEX), agriculture, etc. For example, expensive and vulnerable slip rings can be superseded, reducing maintenance and extending the life of the product. In medical technology, too, contactless energy transfer offers numerous benefits. Special requirements for hygiene and sterility of medical devices apply here, while the devices and systems must also be resistant to harsh cleaning agents and chemicals. Contactless energy transfer eliminates the need for special connectors with (for example) particularly good seals. Since increasing amounts of data are transmitted wirelessly - e.g. via WiFi, Bluetooth, etc. - transferring the required energy wirelessly as well is a sensible development. 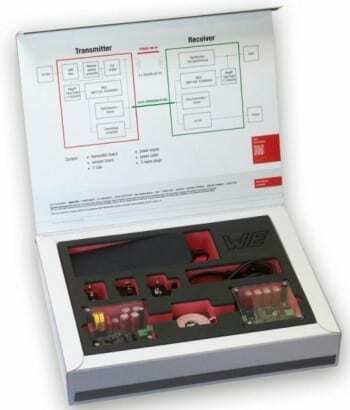 The aim of this development kit and associated application note is to show the developer how a proprietary contactless power transmission system rated at several hundred Watts, including data transmission, can be created simply and efficiently.